Comforting a tearful virgin is the only reason I'd go to a football match. It's appalling having all this stuff going on during the cricket season. I like the idea of having a penalty kick with no goalkeeper, though. That referee was a master of the absurd. Nice pics tho'. Lee Bowyer and Wayne Rooney, right? Quite right too. 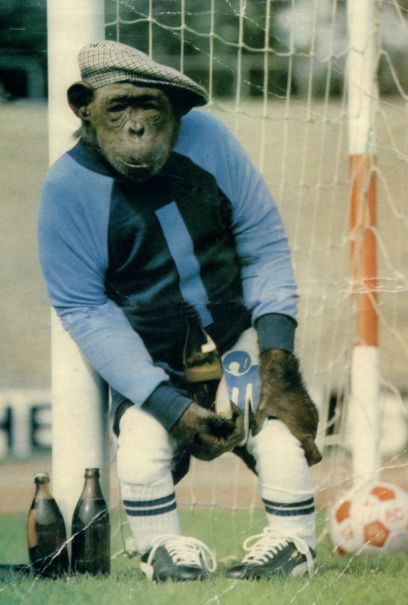 Although now that Roy has departed soccer is in need of another great ape. Matt le Tisser not withstanding. But he is more of a gibbon. I'm quite surprised that the ball made it through without accidentally being consumed by a wandering mote. Such a flaw in drifting vision with a suitcase to boot, what wouldn't I.
Oh how I laughed ... a bit difficult at the moment as I've lost my voice. Now if only you were European you could be the ladies' choice in our fantasy Euro squad. I think you qualify for a Belgian passport. I'm sorry to hear you've lost your voice, Maam. If you were in the Congo, I'd recommend a mug of warm coconut milk with a dash of crocodile blood. I'd welcome a croconut cocktail right about now. With an umbrella. And Rooney's head on a platter for being such a groin-squishing plonker. I don't like to scapegoat and am no expert in either football or the possession of testicles, but, really, ouchee and what a twit. You are no patriot, sir. (I know you're Congolese, I'm referring to your cultural and educational alma mater). We could have done with you in goal last night. Poor Robinson just wasn't up to scratch. Yes, I'm aware of yesterday's tragedy, Aunty. It's interesting how a girl from the Outer Hebrides has no problem in supporting the English, whereas the folk from Glasgow and Edinburgh were no doubt celebrating into the night. I expect Dr Maroon to put up a post titled 'A great day for Scotland'. I, of course, am neutral in these human squabbles. I still maintain that the circular shape of and the interestingly contrasted black and white colors of the game play orb are the most singularly entertaining part of the whole football experience. I have revealed your dirty secret, ape. The mark of a true artist is someone who can cast new light on a mundane or overworked subject......GB, you are truly the dog's cojones....sublime post! One of your best GB. Who's the chimp in the red shirt? He looks like a hooligan. He looks very human, doesn't he, Dr Joe? I believe he's an actor imitating a player who's just been fouled. I'm glad you liked the story, SB. I think you need to know a bit about football to appreciate it. Have you tried rugby GB? the strength of your kind is greater than a humans and without the need for drug taking i for one would cheer you on. Or how about wrestling? in thw WWF? I don't know about rugby, Charlie. I've heard all kinds of foul deeds occur in those rucks and mauls. 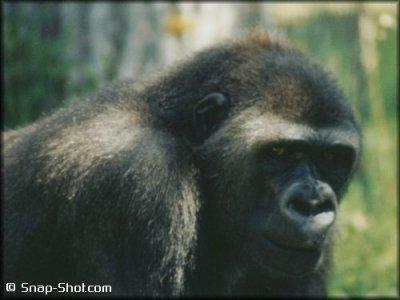 Wrestling, on the other hand, is something gorillas have been doing long before humans made a mockery of it.